The archway “Arco dei Gavi” is a monument of the I century A.D. which was built by an important family of Verona, the “gens Gavia” for self-celebration purposes. 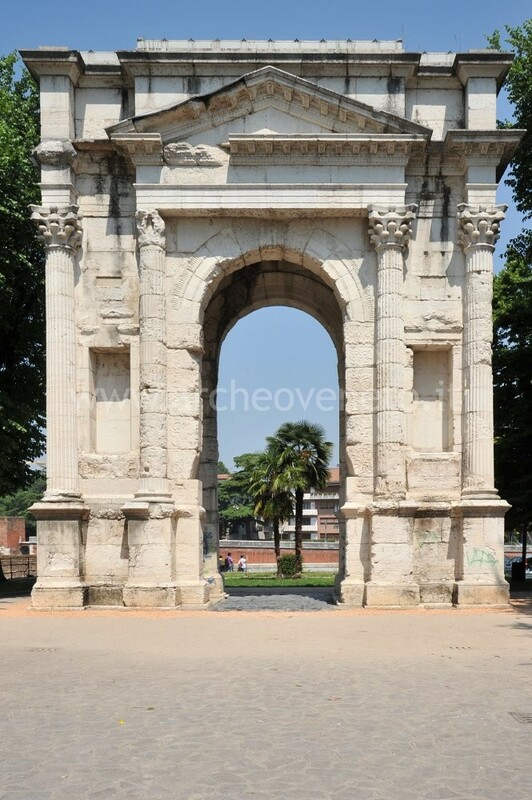 Originally the archway had been constructed along the road “Via Postumia”, the big consular road that reached Verona. In 1805 was considered as a hindrance to local traffic and was dismantled. In 1932 the archway was reconstructed in a different location. However, the previous positioning of its pillars is marked on the paving in front of the Museum of Castelvecchio in the street “Corso Cavour”. Originally the archway “Arco dei Gavi” was on the road “Via Postumia”, in line with the gate “Porta Borsari”, 550 metres far from the latter. What we can see today is the reconstruction of this monument, out of its original positioning. The reconstruction was carried out in 1932 after it was dismantled in 1805. Verona is located along the Adige river, where this enters in the Po plain, at about thirty kilometres east to the Garda lake. Its altitude is 59 metres above sea level and it is placed at the basis of the Lessini mountains. 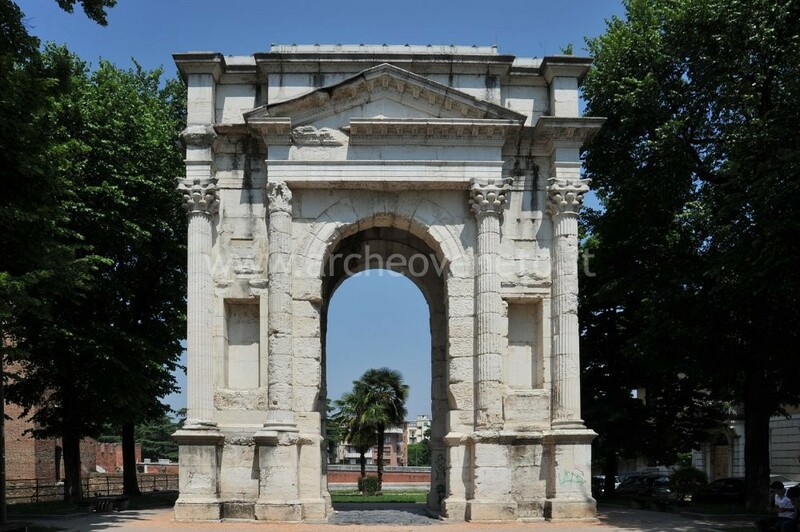 The honorary archway “Arco dei Gavi” was located just out of the Roman town, on its west side, about 800 metres from the gate “Porta Borsari”. Roman archway “dei Gavi” in "Piazzetta Castelvecchio"
Originally the archway “Arco dei Gavi”, which was built by the family “gens Gavia” for self-celebration, was located out of the Roman city, along the road “Via Postumia”. Its original location can be recognized today because it is marked on the modern paving in front of the Museum of Castelvecchio. The archway was dismantled in 1805 and was reconstructed in the square “piazzetta Castelvecchio” in 1932. The archway is made of local limestone and it is four-fronted, thus allowing the passage across the road “Via Postumia” and between the two sidewalks. The two main fronts are decorated with four Corynthian semicolumns on plinths. The four passages are covered by coffered vaults and bear some inscriptions among which that of the architect “Lucio Vitruvio Cerdone”, the designer of the arch who in the past was mistakenly believed to be the famous architect of Augustan times. Other inscriptions celebrating the members of the “gens Gavia” are located at the bases of the niches facing the passage along the central arch. Thanks to the demolition of the arch in 1805 it was possible to notice, on the blocks, some abbreviations in letters and numbers (not visible today) that had been engraved at the quarry in order to facilitate the assembly works. 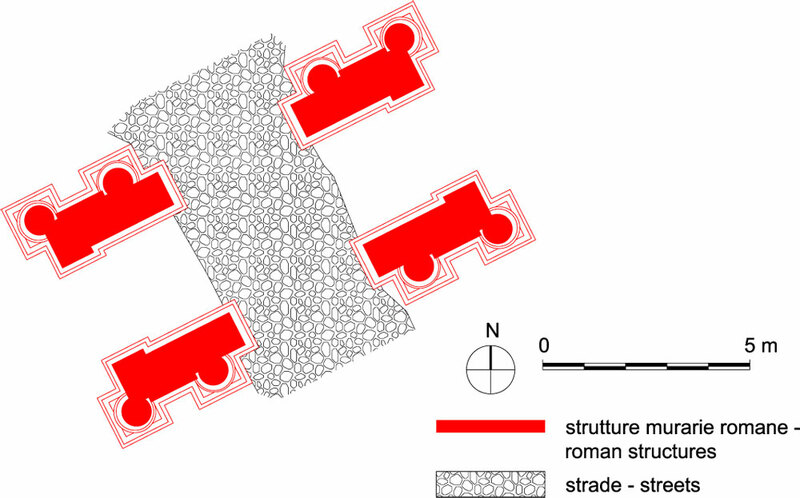 This find is an interesting document on building techniques in Roman times. Under the archways a piece of the road “Via Postumia” has been reconstructed. The road is paved in black basalt and still displays the carts tracks. Mangani E., Rebecchi F., Strazzulla M.J. 1981, Emilia, Venezie (Guide Archeologiche Laterza), Bari, pp. 176-178. Tosi G. 1983, L'arco dei Gavi, Roma. Cavalieri Manasse G. 1987, Verona, in Il Veneto nell'età romana, II, a cura di Cavalieri Manasse G., Verona, pp. 33-34. Archeologia a Verona 2000, a cura di Bolla M., Milano, pp. 84-85. Tosi G. 2003, Gli edifici per spettacoli nell’Italia romana, Roma, pp. 537-540. Bonetto J. 2009, Veneto (Archeologia delle Regioni d'Italia), Roma, pp. 448.